Not only financial freedom, but the freedom to work from the comfort of your own home on your own time? If you answered YES to any of these questions, then look no further. Our Life Coach Certification Atlanta program is the perfect fit for you! Certified Life Coaches have the ability to choose when and where they work. Because life coaching is typically done over the phone, you can literally work from anywhere. Work from home or work from an office, you could even work while on vacation. The choice is yours! Unlike some other certifications, which require you to invest thousands of dollars and can require up to two years of training, we offer a 1-Day Intensive Training seminar. Our one-day program is backed by the #1 Premier Life Coach Training Organization in the world, the International Coaching Science Research Foundation (ICS Research). We’ve condensed our training into an intense one-day seminar in which we provide you with everything you need to become a professional life coach! After completing the course you’ll be provided with on-going support from our teachers and other graduates. 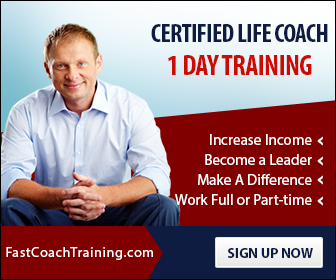 If you're looking to make a change NOW and not tomorrow, then becoming a Certified Life Coach is perfect for you. Do you want to Lead? If you answered YES to any of these, then absolutely becoming a life coach is right for you! ✓ Continual Weekly Coach Support. We believe in our product and you so much, that if you aren't completely transformed we'll give you every penny back. With over 20 years of training and more than 5,000 certified life coaches, our program simply works. Join our network of Certified Life Coaches and achieve true Freedom.